Localization means the actual language your SugarCRM CE will be displayed on. With the default installation you will perform via the Softaculous auto-installer or manually the SugarCRM CE instance will be displayed in English and in the next lines of this tutorial we will show you how to change that setting and few others. In order to access the dedicated page to the Local Settings you will need to login into your website and then to access the admin area of the website. Once there you will need to click on the "Locale" link located under the System section of settings. Once you do that you will be presented with the available settings for your localization. Once you are done with these changes please click on the Save button which can be found at the top or at the bottom of the page. Once you are ready with these settings you can move forward with the next section or you can save the settings using the "Save" button located at the top and at the bottom of the page. Once you are ready with all the configurations here you can either save the settings using the Save button located at the top and the bottom of the page or you can proceed with the settings in the other sections. The last section of settings on this page is called Database Collation and as the name suggests you will be able to set the default database collation for the database of your website. Congratulations! 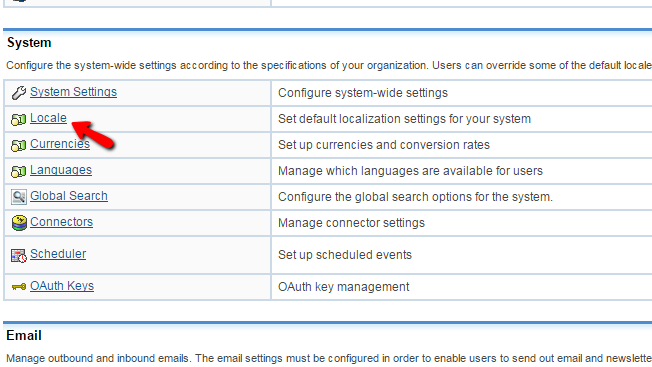 You now know how to configure the Locale Settings of your SugarCRM CE based website!